The stage was set in the premises of Hotel Diamond Glory in Mandarmoni, West Bengal, and we were eagerly waiting backstage to take to it and start our set. There was both excitement and nervousness in the air. After all, this was going to be our first ever live show. 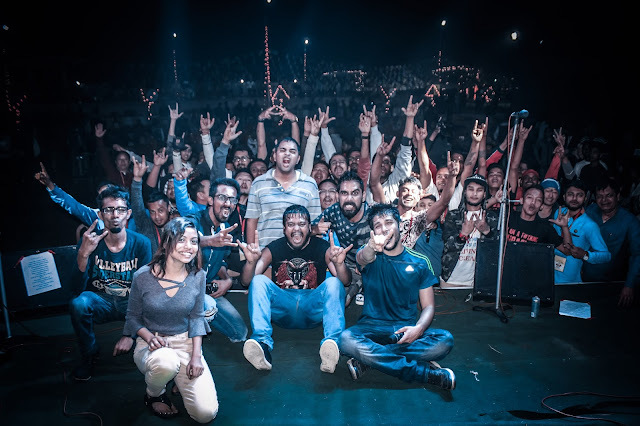 As Subrata, the band manager hit play on the band’s intro music on his laptop near the sound console, we took our steps up to the stage, as the blinding lights and a cheerful crowd of more than 350 greeted us with rapturous applause. The journey started in South Kolkata, as all of us woke up, got ready, and left our respective houses to catch the car, which would pick us all up one by one from the designated locations. It was supposed to be a 4-5 hour journey to the beach resort town of Mandarmani, but thanks to a lengthy stop for breakfast and an unplanned halt at Contai due to a punctured tire, we reached around 1 PM and immediately started making preparations for our sound check. After setting up the drums and getting the sound balanced, it was finally time to relax for a while. We were supposed to take up two rooms at the hotel, but unfortunately, all the rooms were occupied. However, the organizers were very kind to get us two rooms at two other hotels. While Sam, Sulagna, and Sudipto took up one room, Adee, Dubai, Subrata, and Shubhashish (our photographer) took up another. While the first group decided to relax in the room, the second made their way to the marvelous Mandarmani beach and spent some quality time there in the lap of nature. But they had to get ready soon, as our car was ready by 7 PM to take us to the venue. The show had come to an end and all in all, it was one hell of an experience for both the band and the audience, most of whom had turned into fans and supporters during the course of our set. It was also time to pay tribute to the occasion. This was not just another random gig; this was to celebrate the lives of people who had given up hard drug addiction and returned to normalcy in their personal and professional lives. We strongly encouraged the crowd and encourage all those who read this to steer clear of hard drugs, as they can wreak havoc not just for you, but for your near and dear ones as well. April 30, 2017; Kolkata: It was a fantastic Fun day (Sunday) evening spent with music, great audiences, awesome ambiance and with some renowned faces from the Tollywood industry in the cultural capital of India. Musical night has always been the favorite for the Bengali people, so a bunch of enthusiastic and responsible young professionals known as Triple Eye Studio Production decided to take an initiative towards social development through the path of music. It was at Metro Shopping Center near Maidan where Smile Foundation present INDIE JAM season 3 was held. Triple Eye Studio Production with the support of Dr. Sohini Sastri took an initiative for the education of the underprivileged children with the help of Smile Foundation. It was the introductory stage for ‘’The Monkey’s Smile’’ as a supporting artist for this campaign. Though it was the first stage for the band but not for the members. But the evening, audience and the ambiance was incomparable. The sound was awesome too and the crowd warmly welcomed the band with their cheers and claps. Overall the experience was great and it always feels good when playing for a social cause.